My nephews did a little science experiment this week. You know how cut flowers continue to “drink” when placed in water? If you have white flowers and put food coloring in the water, you end up with colored flowers! The experiment demonstrates transpiration, cohesion, capillary action, and all that jazz. 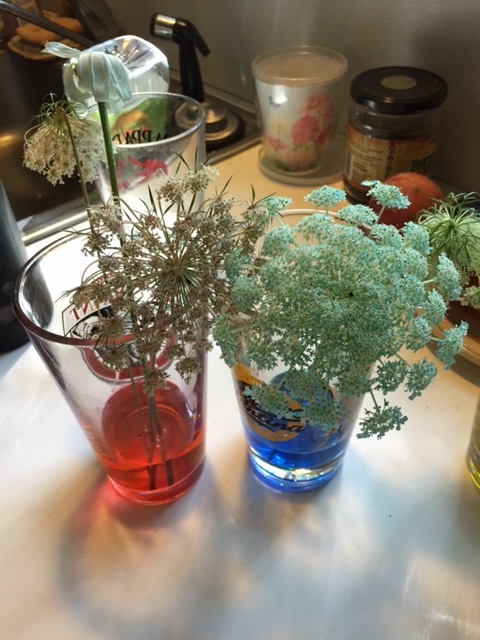 They used Queen Anne’s Lace and blue and red had the best results. Take a look! Those glasses appear to have been pilfered from a local bar establishment !! Just what have you and Brian been up to ????????????? ?